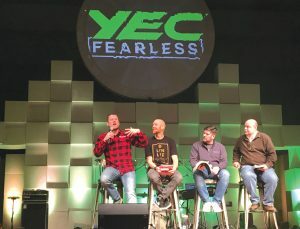 DAVIS—Students were challenged at the 2018 Youth Evangelism Conference (YEC), Jan. 14-15 at Falls Creek Baptist Conference Center to share their faith in a “Fearless” way as they go about their lives as Christ followers. 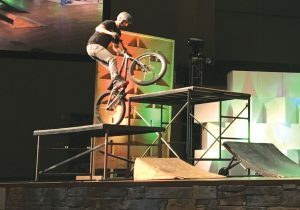 Students were met with several “Fearless” elements while at YEC, including the Real Encounter Stunt Team, a ministry outreach made up of professional athletes and ministers in the area of Moto Stunting, Street Bike Stunting and a BMX Bike stunt team. Dramas were presented by the Clear Vision Drama team, a six-person team that shares the Gospel through means of drama and creatively challenging Christians with Biblical truths. Nick Thurmond and his band led worship for the weekend. Real Encounter Stunt Team performed several times at YEC. It is a ministry outreach made up of professional athletes and ministers. Zane Black was the feature speaker for YEC. Black has a powerful testimony of freedom from addiction and redemption in Jesus Christ. “He’s got a real heart for not just rescuing people from the hell they’re going to, but from the hell they’re going through,” Baldwin said. On Monday morning on Martin Luther King Day, in the third general session, Baldwin, Black, Todd Sanders and Andy Harrison took to the Falls Creek stage to explain an effective way of sharing the Gospel using the acronym, G.O.O.D. N.E.W.S. The “G” of G.O.O.D. N.E.W.S. stands for “Go to God in prayer.” Black related sharing the Gospel with friends to extreme sports, in a high adrenaline moment when there is fear, and told students to harness that fear and cling to Jesus. Black said, “Before you ever talk to people about God, talk to God about people. In that, you have the opportunity to tap into the unlimited resources of heaven.” He then referred to Matt. 10-19:20 and reminded students that God can speak through them. The “O” in G.O.O.D. N.E.W.S. stands for “Open up a conversation,” which Sanders, BGCO student education specialist, explained. He told students to see people as people, and not as a project, then used an acronym of his own: L.I.F.E. Brian Baldwin, Zane Black, Todd Sanders and Andy Harrison explain the G.O.O.D. N.E.W.S. Gospel in general session. Andy Harrison, BGCO student ministries specialist, talked about how differences in beliefs should be met by listening to what someone believes first. Then the student can share their faith once they’ve first listened to who they are speaking. “You want to build a bridge and not a wall between that person of another faith and yourself. Even though what they believe may be incorrect, you can still admire their devotion to it,” Harrison said. Throughout their time at YEC, students had the opportunity to attend breakout sessions that covered a wide variety of topics. 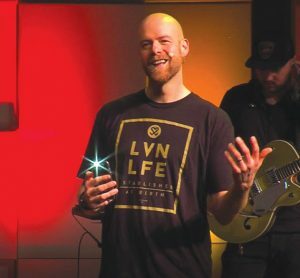 Nick Howk, Oklahoma native and student pastor at Houston, Texas, TheMET, spoke with students about inviting their friends to church and youth group functions “with excellence.” Howk explained when people receive an invitation, it makes them feel wanted. He talked with students about Jesus’ open invitation to anyone who is willing to make the life-changing decision to have a relationship with Him. Black, the speaker for YEC, holds his phone with it’s flashlight on to symbolize that he had a Gospel conversation, something he asked students to do in a general session. Baldwin pointed out that while YEC is important, the most important thing is how students apply what they learned to their everyday lives once the event is over. Youth groups, as a whole, were encouraged to make a “Strategic Action Plan” about how they would implement what they learned about evangelism into their schools and churches. 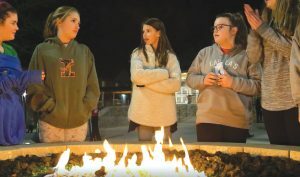 Students gather around a fire pit on Centennial Plaza. In the final general session of YEC, Black asked students to bring their cell phones. He then asked students to start or have a Gospel conversation at that moment whether it be through sending a text message or making a post to social media. Black instructed, once students were done, to turn on the flashlight on their phones so that everyone could visually see the Gospel conversations happening in the room. Students also took part in the 72 hour challenge in which they agree to have a Gospel conversation within the following 72 hours from YEC. This is a challenge with which Oklahoma Baptists may be familiar. “After the 72 hour challenge and having everyone text their person to start a conversation I had a 7th grader lead her friend to Christ over the phone within just a couple hours of being home,”said Jesse Peters, youth pastor at Blanchard, First. 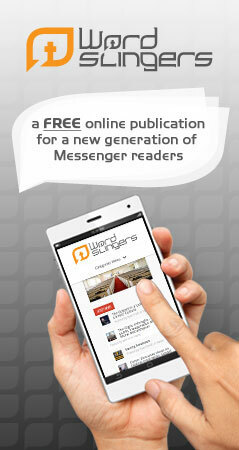 Emily Howsden is the Digital Content Coordinator and a staff writer for the Baptist Messenger. View more articles by Emily Howsden.